When it comes to surprises in your fridge, there are the good, the bad, and the ugly. Leftover soup that tastes even better today than when you first made it yesterday? Good. An empty milk carton? Bad. The moldy cadaver of a plum that got lost behind the bottom drawer months ago? Ugly, definitely ugly. Well, I'm all about keeping things on the sweeter end of this spectrum, and I can't imagine a sweeter surprise in the fridge than a box of assorted cupcakes made just for you. Here's what Nikki hid in the fridge as a birthday surprise for her boyfriend Leif: a box of rich chocolate cupcakes with an assortment of his favorite toppings and flavors. 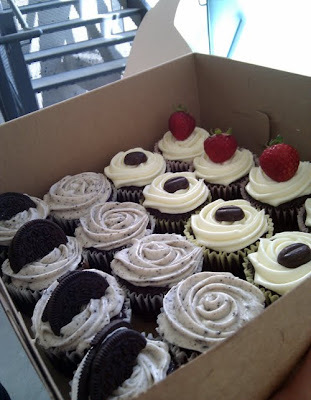 On the left half of the box, we had cookies and cream cupcakes with crushed Oreos blended into vanilla cream cheese frosting. 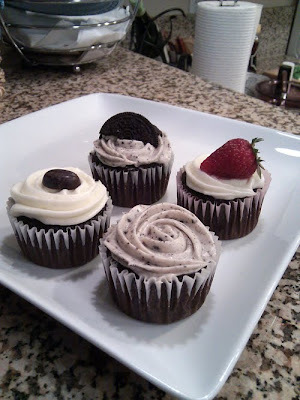 The cupcakes on the right half were topped with silky, bourbon-splashed cream cheese frosting and either a chocolate-covered coffee bean or fresh summer strawberry. Thanks, Nikki, and happy birthday, Leif! We hope you enjoyed your sweet surprise as much as we enjoyed baking it. What's cuter than a cupcake?